Alyssa Hendrix and Carly McNatt each won individual state titles this weekend, but these speedy ladies are not done with their stellar seasons. Each will go on to compete at national regional races in the next two weeks for a chance to compete at the national level. 2017 Footlocker finalist and now 4A state champion, Alyssa Hendrix, had an incredible run this past weekend -- kicking the state championship races off with a win in a time of 17:40. The Riverview junior was the only one in her field to break the 18 minute barrier and after a runner-up finish last year and a third place finish the year prior, her time had come to take the win. Mary Ellen Eudaly, the standout freshman out of Plant HS, hung on Hendrix through the two mile and Hendrix pushed the pace and took a significantly lead with 1200m to go. After coming back from a deviated septum surgery over the summer and missing training, Hendrix has proved that she is a tough competitor and will be amongst the top in the races she participates in. Hendrix will head back to Footlocker South Regional next weekend where she will have a strong chance to make it back to the national meet in December. The eighth grade Holy Trinity running and tennis star, Carly McNatt, took home her first state title this weekend, winning the 1A girls race in a time of 17:35.37. McNatt improved her time from last year's state final by over a minute and half! She took a commanding lead from the gun and was relentless on the ARP course. McNatt has shown through her numerous sub 18 minute performances that she is one of the best in the state. Since McNatt is only 14 years old, she is too young to compete in the seeded race at the Footlocker South Regional. Have no fear, McNatt will be racing at the Nike Cross Southeast Regional in Cary NC next week, for a spot at NXN. 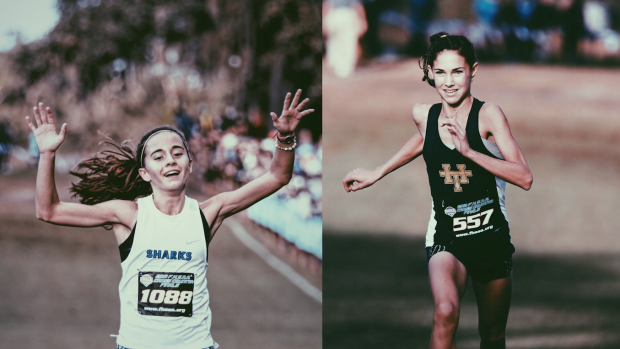 Both of these ladies will return for the 2019 cross country seasons next year to defend their titles and the depth of Florida distance running will continue to progress.